Home » Stories and Recipes » Apple » Season to taste with a pinch of nostalgia. Season to taste with a pinch of nostalgia. I grew up in Amherst, MA. The fall was synonymous with apples. McIntosh apples to be specific. They were the apples we bought by the bag full from Atkins Farms. They produced the cider that we drank and that flavored Atkins’ cider donuts* (which I was also tempted to eat by the bag full). Marianne, the cook at the Bement School, where I went from 4th to 8th grades, always had a bowl of them waiting at the end of each school day as a snack for our ride home. At home there were apples too. Fresh apple sauce, pressed through the food mill. Mom made apple pies and apple bread. My favorite though, was her apple crisp. Fresh out of the oven it would bubble – syrupy inside and crumbly like a cookie on top. The recipe was simple and I learned it early. The card, typed out by my Grandmother had a note written by my Mom: “Gram’s recipe ’68.” Calling for juicy, tart apples, it was the perfect vehicle for an abundance of McIntosh. When I moved to DC and first started shopping at Eastern Market I saw the fall bounty of apples and searched for the perfect McIntosh of my youth. When I finally found some and took my first bite, I was disappointed. The sharp crack, the crisp flesh and the juice running down my chin were absent. A bit of research revealed that apple varieties develop texture, sugar and juice better in some climates and soils than others. My perfect New England apple was not to be found in the warmer fall nights of the mid-Atlantic. Much to my delight, I discovered Marvin Ogburn and Long Meadow Farm. Marvin has introduced me to apples that ripen beautifully here. Sweet Honeycrisp, firm Stayman, tart Nittany, and new this year, the crisp Kiku. Marvin also has Empires, the closest to a McIntosh and as crisp, sweet and juice as any Mac I have eaten, but everything always tastes a little better with a hint of nostalgia. 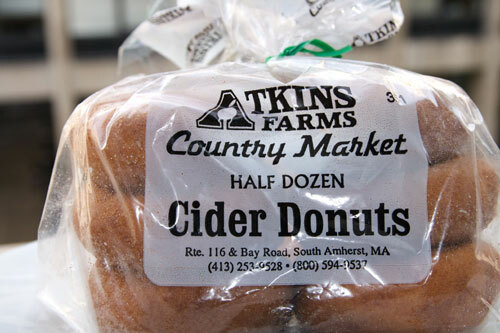 *You can now order Atkins’ cider donuts online. I suggest you do so. Immediately. 3 pounds tart apples, about 7-8. Nittany or Stayman would be perfect! Pile apples in a baking dish. If you want more crust go for a shallower and wider dish. And double the recipe for the topping. Blend the remaining ingredients with a pastry blender. My Mom pulses them in a food processor until they come together. Serve hot or cold with or without cream*. *No surprise here, but I would strongly advocate pouring fresh, local cream over the top of each dish.